Galco Vertical Shoulder VHS Holster Component (Tan) FREE SHIPPING! Professionals who carry a firearm as part of their daily work recognize Galco's Shoulder Holster Systems as the most comfortable and concealable in the world. After all, they have spent the last three and a half decades perfecting them--and they haven't stopped searching for ways to make Glaco holsters even better! After a number of helicopter pilots in LE Air units briefed Galco on their special needs, they turned thier attention early in '04 to designing a new Vertical Shoulder Holster System. Combining features from the Miami Classic Holster with a traditional vertical shoulder holster into a system that's perfect for 21st century in-flight LE and Emergency Personnel. It allows comfortable carry, and can be worn exposed over a flight suit in emergency room settings without alarming civilians with an exposed horizontal muzzle. The VHS has been field tested over military BDU's and general hunting clothing as well, with great success. And although Galco did not set out to create another concealment rig, they discovered that they did!--it's hard to break away from one's roots. The new VHS provides the long-awaited alternative for those who want the concealment of our Miami Classic but, for what ever reason, prefer the classic vertical carry style. 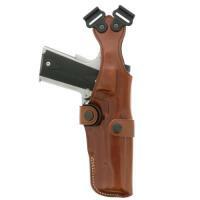 This holster component is constructed of premium saddle leather. A harness and ammo carrier CAN BE PURCHASED SEPARATELY. The Vertical holster component was designed to function without a holster side tie down and will not accommodate one. For these and other VHS accessories and components that may be purchased separately, see shoulder system accessories. The Vertical Shoulder Holster is ambidextrous. This one is great This must be the newest version it has a extra snap on the side for tie off to my belt. Works left or right handed. ©2002-2019 CopsPlus.com: Galco Vertical Shoulder VHS Holster Component (Tan) FREE SHIPPING!